Armchair Pundit: Where Will Liverpool Finish In The League? 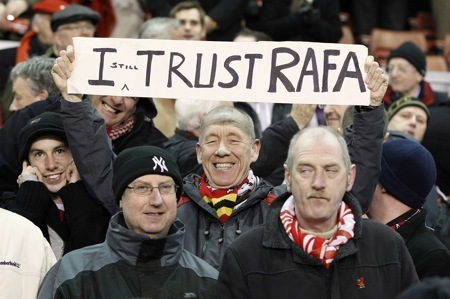 Rafa Benitez has promised on more than one occasion that Liverpool will finish in the top four this season. Last night’s impressive 2-0 win over Spurs adds weight to the Spaniard’s bold promise. Liverpool now lie sixth with 37 points, just one point behind Tottenham and Man City (fourth and fifth, respectively). Of the quartet of clubs in with a realistic chance of finishing fourth, I’d back Liverpool (as I did earlier this season) ahead of Aston Villa, Man City or Tottenham. I put the same simple question to y’all: where do YOU think Liverpool will finish? You know they’re annoying enough to end up 4th. I can just imagine the barrage of smugness now. i think we’ll finish third ahead of man u, after rooney gets injured and they half a second half of the season like our first. Said at the start of the season that without Alonso it would be a great achievement to finish fourth, but I didn’t take account of the exceptional injuries and beach balls and now think fifth would be above par. Anything better than that would be Rafa genius beyond anything he’s done before, 7th or lower would have to be considered a failure. when they play as a team, they are formidable. with smart sales and buys this january, i would be shocked if they finished outside of the top four. two months ago, arsenal were eleven points from the top of the league. today, liverpool are eleven points from the top of the league. in two months? we’ll see. Sorry to cherry pick an old post of yours, but in a post after the Reading game, amongst a bunch of other laughable conclusions from Rafa’s transfer dealings, you said that EVERYONE could see Torres would be a star. Are you kidding me?? when he signed him Sky was on him like a shark about how he never scored enough and cost way to much money. I’m sorry but when you post stuff like that it is quite infuriating. Much less biased in your posts after last night. Sorry, just had to get that off my chest.